You know how there’s a secret world behind this one? Where, if you can get your finger just under the thin superficial layer, you can peel it back to reveal the squirting beat of six thousand hearts, the subcutaneous engine of all this stuff? No? Carl Baratta does. His paintings describe the mystical underbelly of reality—lycanthropy, planets in retrograde, the secret algebra of alchemy—made available to him by sessions in the library with fellow painter-conspirators and frequent trips to Wisconsin, the mother lode of the wacky sublime. Wisconsin, by coincidence or maybe there’s something in the water, breeds and nurtures visionary artists, also called folk artists or outsiders, and many Chicago-area artists have solidified their own style by looking north. A visionary artist’s mixture of humble materials and unbridled creativity sparks recognition in the reptile part of the brain. Baratta also has a vision, and he lives in the Midwest, so does that mean he’s a Midwestern Visionary Artist? He jokes, it’s not like he was on his farm and got hit in the head by a meteor, thereby granting him the ability to see the world in 48-bit Deep Color (although he is a great colorist). He got an undergraduate degree in art, and then a graduate degree in painting, so he’s not a self-taught outsider; but he’s certainly painting from within a pocket of his mind. The other day Carl and I were looking at some drawings by Joseph Yoakum—an influential Chicago visionary who made art from the memories of his many travels—and we saw all sorts of eyes, faces, toothy mouths, hairy wolf tongues and “fertile lobes”—an actual inscription by Yoakum—all staring back at us from within the artist’s slithering depictions of hills and caves. If you enjoy comfortably strange pictures, Yoakum’s your guy. (Carl also appreciates Henry Darger, but imagines that you can smell the artist’s grimy beard in his pictures; Darger’s pictures are borderline pedophiliac, yet their popularity doesn’t suffer for it). On that day we also looked at an educational pop-up print from the days when scientific fact resembled religious doctrine (Germany, c. 1635). In the print one could lift up layers of the sun to see Christ, then behind him, another layer: the Anti-Christ; or open the doors of a pregnant woman’s belly, and anything dreamed up by a Medieval mind could spill out. The similarities among Yoakum’s landscapes and the religio-medial print aren’t as far-fetched as they might seem. Baratta delights in scouring for arcane imagery, so long as the imagery bespeaks a heightened sense of discovery. It seems there’s always some adventure to embark upon in his paintings, each containing a witch’s brew of influences: HP Lovecraft, Aleister Crowley’s dark arts, Carl Jung’s psychology of symbols, Yoakum’s animism, William Blake’s religious ghosts, glam rock, Indian and Mogul miniatures, Norse mythology, Japanese monsters, putrefaction rituals and his own basement mythology. The question of citing influences is tricky if an aura of originality is to be maintained, but Carl has that figured out. He teaches an art course called “How to Steal.” Basically, there’s just so much stuff floating around us like fruits ripe for picking. Once we eat those fruits, they can be incorporated into our lives or art practices. This is far from common cynical appropriation techniques. 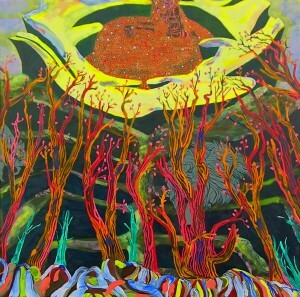 Carl uses the tenets of alchemy as a model for how change and transformation can help artists develop their practices. (He also looks to David Bowie, the prince of self-reinvention). Carl admits that there’s a therapeutic element to his course. There’s often some sort of battle occurring in Carl’s paintings, or else there’s a single corpse quietly rotting in a forest nook. One epic battle, in “Shine On Forever! 2,” has a naked hairy man with a head straight out of Ultraman and wearing slippers fighting a figure decked out in Marc Bolan (from T Rex) pants. Just as so many of the visionary artists made objects from what was at hand—seashells, cement, wine bottles—Carl uses what’s available—pop-culture detritus and the dredges of the library. The battle sounds like a ridiculous adolescent fantasy and it is; but also, it’s not—there’s something ancient about it, especially as it takes place in the canopy of a darkened woods with glowing trees. There’s so much to say about Carl’s landscapes and his compositional abilities, but ultimately they’re best understood as visual experiences. His newest painting, “I Know About The Leaves, How They Puddle and They Go,” is a landscape that was constructed on the face of a lion and the back of a caribou. The animals melt behind layers of paint, river and wood until no longer representational, but they’re there, just as at the edge of the forest, behind the trees, there are eyes staring back at you.